In this ScrollMagic tutorial we’ll build a simple scrolling slideshow with a fullscreen sections. 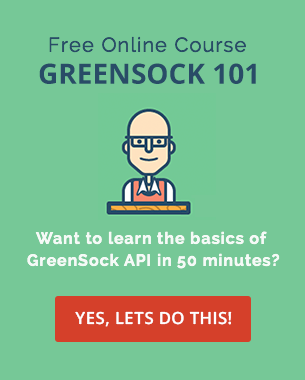 You’ll learn how to lock elements when they reach a certain point and get familiar with triggerHook, triggerElement, setPin, addIndicators and setClassToggle terms. Lets start with a plain simple html for our 4 sections. Create 4 section elements and give them a unique ID. We’ll use this ID for styling purposes. The .inner will keep the text centered and have the max-width set to 85% to prevent text touching the edges of the browser on smaller screens. I am using Sass for my CSS, in case you are wondering why some of the elements are nested. I am using lighten and darken for the alternative background colors, if that doesn’t make sense read this article. main.js is a file where we’ll be adding the ScrollMagic code. Create an empty main.js file inside of a js folder. The first thing we need to do in our main.js is to create a ScrollMagic controller. Hey scrollbar, animate the thing I’ll tell you when I’ll tell you. There are a few other settings for triggerHook – onEnter, onCenter (default), onLeave. I’ve explained that in more details in SVG Scrolling Animation Triggered By ScrollMagic. We want each of the sections to be pinned or fixed when they reach the top of the viewport. For that we’ll use the jQuery .each function. By default the ScrollMagic trigger is positioned in the middle of the viewport but we’ve set triggerHook: onLeave in the previous step. That’s why the sections are fixed when they reach top of the viewport. this refers to the individual sections. Hey scrollbar, when the section reaches the top of the viewport, pin it. If you did everything right you should see each section fixed to the top and the following section overlapping the previous one when you scroll. You can read more on .setPin in the ScrollMagic documentation. Our example is very simple, but lets have a look how you can include and customize indicators to debug more complex scrolling animations. Include debug.addIndicators.min.js below the ScrollMagic reference. Now update the main.js and include .addIndicators in our scene. Now you should see right aligned indicators, visually showing you the trigger position and when each scene starts and ends. The default styling of these elements (red, green, blue) can be overwritten to suit your design. We’ll set our indicators to lighter colors to make them easier to read. This will change the color of our indicators to white. We are also passing the ID of our sections to the name. Now the labels read start two, start three etc. Again this is very handy for more complex ScrollMagic animations. You can read more on .addIndicators in the ScrollMagic documentation. If the indicators are not enough, you can also get a lot of useful info logged in the web developer tools console. When you now open the console, you’ll see a lot of data related to the scrolling animations and events. We might explore all this data next time, for now just keep in mind that you have a lot of debugging tools available at your fingerprints when using ScrollMagic. The last thing we’ll cover today is how to change a class of any element based on the scroll position. We’ll create a new ScrollMagic scene and use the .setClassToggle method. This means that section#four gets a class .is-active when the body is 300% or 3x window heights out of the viewport. Add the following CSS to see the last section fade to black. You can read more on .setClassToggle in the ScrollMagic documentation. If you’ve enjoyed this tutorial you might also like SVG Scrolling Animation Triggered By ScrollMagic. Now you know how to include ScrollMagic, pin elements, customize indicators and toggle a CSS class on page scroll. Next time we’ll trigger a simple Greensock timeline. Sign up to my email list for more ScrollMagic tutorials and demos. And let me know in the comments if there are any specific websites or examples you would like me to cover in the future tutorials. Until next time, happy scrolling. 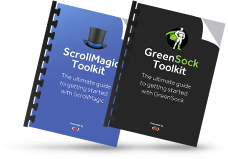 Hi Petr Tichy, Its a good article to get started with scrollmagic. Suppose i have 4 section of slide show and then i dont want to have slideshow and just want normal elements. One addition to other readers of this wondefull article if you are putting these section in columns or row of bootstrap make sure make it 100% height else will not work. Thanks Fahim. You would need to set a duration for the pin elements and unpin them when the normal content comes in a view. I might include that in my next ScrollMagic demos. Also thanks for sharing the note for Bootstrap users. Hi Petr, I am trying to use your tutorial. Its working fine, but when I use it on one page website here http://qbfweb.com/dac/ . On "our services" i have the scrollmagic effect. But when I go under "Our services" and want to go back to "Our Services" its not working coz its under the "testimonials" page. Thanks Ricardo, if there is anything specific regarding ScrollMagic that still doesn't make sense to you, let me know. hello Petr, any chance you would consider doing a horizontal scrollmagic demo? Can scrollmagic work both vertical and horizontal at the same time? What if you have a section with really long content like the following: See the Pen ScrollMagic Example by Al Lemieux (@alemieux) on CodePen. Hey Al, currently you are creating a ScrollMagic scene for each of your sections in the $("section").each() function, but what you could do instead is to pin the first section, then have a normal page flow and then pin the third section when it comes to a view. That way your second section could contain as much content as you need. Or you could try to scroll just within the second section when it's in a view, but that might more complex. Hope that helps. Petr, OK, I'll have to look into pinning. How do you figure out the distance and calculate the duration? Is it the height of the content or the height of the viewport? Confused. Actually, I think I found the solution. Each sections height was set to 100%. The CSS forces that section to be that height. Hi Petr, I am trying this again and again, but unfortunately, im getting nothing. I dont know where i am making the mistake. 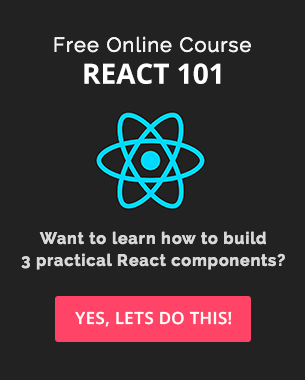 Is there any video tutorial on this blog? Please help! Hi Siddhant, your link doesn't open. Check out some other ScrollMagic tutorials and let me know if you have any suggestions for my future ScrollMagic tutorials. Hi there, thanks for the help Shashank. I think i have included all the required scripts at the end of body.. you can see. https://drive.google.com/open?id=0B4-Wall5Acz8Y1dCdWxTMlV1QWs . telme if it requires something else. Hi, thanks for the reply. Yes those demos also have issue, whenever pinning is invoked. I think there is some problem with how safari calculates top:0; I think it has something to do with safari feature that allows website to be seen from toolbar transparency. Hi Nikolaos, thanks for getting in touch. And yes this can be done using ScrollMagic. Check out the ScrollMagic 101 to get started. Hey Petr, thanks for the reply, I have actually been using it and I registered for your online course as well. But I haven't gotten to the part whee I am able to do that so looking at your example I was able to do this http://173.247.242.190/~theage6/staging/the_liddel_main_dev/ But i can't get the other section to go all the way up so it stops mid way. Any pointers? Hi Oleg, checkout this Codepen. It has a ScrollMagic._util.addClass at the top, that is a workaround to toggle multiple classes as intended. Its a good article to get started with scrollmagic. Suppose i have 4 section of slide show and then i dont want to have slideshow and just want normal elements. One addition to other readers of this wondefull article if you are putting these section in columns or row of bootstrap make sure make it 100% height else will not work. Thanks Fahim. You would need to set a duration for the pin elements and unpin them when the normal content comes in a view. I might include that in my next ScrollMagic demos. Also thanks for sharing the note for Bootstrap users. I am trying to use your tutorial. Its working fine, but when I use it on one page website here http://qbfweb.com/dac/ . On “our services” i have the scrollmagic effect. But when I go under “Our services” and want to go back to “Our Services” its not working coz its under the “testimonials” page. I wanted to say how much I appreciate and love your tutorials. I was having a hard time learning scroll magic on my own. Your tutorial helps a lot! I look forward to the next. Thanks Ricardo, if there is anything specific regarding ScrollMagic that still doesn’t make sense to you, let me know. any chance you would consider doing a horizontal scrollmagic demo? Can scrollmagic work both vertical and horizontal at the same time? Hi Richard, sure I’ll consider horizontal ScrollMagic demo for my future demos. To answer your question: yes it can be used for both directions at the same time. See the Pen ScrollMagic Example by Al Lemieux (@alemieux) on CodePen. Hey Al, currently you are creating a ScrollMagic scene for each of your sections in the $("section").each() function, but what you could do instead is to pin the first section, then have a normal page flow and then pin the third section when it comes to a view. That way your second section could contain as much content as you need. Or you could try to scroll just within the second section when it’s in a view, but that might more complex. OK, I’ll have to look into pinning. How do you figure out the distance and calculate the duration? Is it the height of the content or the height of the viewport? Confused. I am trying this again and again, but unfortunately, im getting nothing. I dont know where i am making the mistake. Is there any video tutorial on this blog? Hi Siddhant, your link doesn’t open. Check out some other ScrollMagic tutorials and let me know if you have any suggestions for my future ScrollMagic tutorials. Hi there, thanks for the help Shashank. I think i have included all the required scripts at the end of body..
telme if it requires something else. 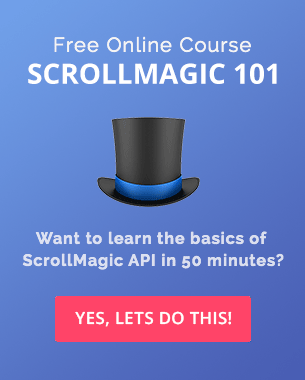 very helpful – to get in ScrollMagic! Thx! We are having issues with Safari, there is a visible jump when second slide hits the top of the window. I think it has something to do with safaris top bug. In your demo it is much less pronounced, because you use colours, in our case with images and other graphics this jump is pronounced… happens only in safari, any ideas how to fix it? Hi Sandro, not sure what the issue could be, but I know that Safari struggles with some the scrolling animations in general, not just pinning. Have you tried any of my other ScrollMagic tutorials, does it have the same issue in Safari? Yes those demos also have issue, whenever pinning is invoked. I think there is some problem with how safari calculates top:0; I think it has something to do with safari feature that allows website to be seen from toolbar transparency. Hey there Petr, I was wondering how to make something similar but all sections to start pinned on top stacked on each other and when you scroll, each section scrolls up and the section underneath stays pinned till the previous section is completely finished scrolling like its here. Pretty much I wanna emulate this. Can it be done using scrollmagic? I would appreciate an email rather a reply. But i can’t get the other section to go all the way up so it stops mid way. Any pointers? ScrollMagic.min.js:3 Uncaught InvalidCharacterError: Failed to execute ‘add’ on ‘DOMTokenList’: The token provided (‘flipInX animated’) contains HTML space characters, which are not valid in tokens.